Experts agree that over 75% of hydraulic system failures are directly tied to contamination in the hydraulic fluid. With numbers like that, it is obvious of the importance of reducing hydraulic fluid contamination. Loss of efficiency, downtime, expensive repairs, catastrophic failure, and system flushing are just a few examples of the aftermath that can be expected from contamination issues. The effects of contamination are obvious, but the question is, how to do you prevent contamination from entering your system in the first place. What Does Contamination Do to a Hydraulic System? When we think of contamination, we usually think of particulate contamination. That can include abrasive particles such as sand, dirt, or metal flakes and slivers. Abrasive particles will score the precision-machined parts in your equipment, significantly reducing efficiency while setting off a cycle that can destroy components such as hydraulic motors and pumps. Non-abrasive particles are very serious as well. Common problems resulting from these particles include clogged ports and stuck valves, which in turn can cause issues with controlling flow and pressure. In addition, any type of particulate matter in hydraulic fluid will increase the probability of cavitation. There is also the problem of moisture contamination. Moisture can react with additives within the hydraulic fluid and result in problematic chemical reactions. The presence of water in hydraulic fluid can cause corrosion which can be a critical problem for many hydraulic systems. Water in hydraulic fluid also affects its elasticity and performance. Most importantly is the cavitation that results when water is trapped within the hydraulic fluid as it experiences pressure changes. Contamination can also cause your hydraulic fluid to degrade, which in turn reduces its performance and adversely affects its ability to lubricate and protect the components within your system. Issues such as corrosion will invariably result, and a thick sludge or silt can form that causes serious problems. These contamination issues are the major reasons for reducing hydraulic fluid contamination. It is not possible, from a practical sense, to completely eliminate all contamination within a hydraulic system, but it is possible to minimize the levels of contamination. Such minimization can be achieved through a carefully developed contamination reduction strategy that takes into account the operating conditions of the system, its environment, and the components that make it up. In developing your strategy for reducing hydraulic fluid contamination, you will want to focus on the design of your system and select targets that are both feasible and quantifiable. Next, develop a list of actions that will support reaching those targets. Typical actions can be broken into categories such as exclusion, cleanliness, filtering, and storage and handling. Removing contaminants after they have made their way into a hydraulic system can be expensive and time consuming. Flushing a contaminated system can also be fairly complicated, and may involve not only adding fresh hydraulic fluid but removing the old fluid from the system and adding all new filters. Filters – The best approach to handling contamination is excluding it from the system in the first place rather than removing it after the fact. Excluding contamination from the system means preventing it from entering the system and depends on filters to capture contaminants that do make their way in. A good understanding of where contamination comes from goes a long way towards stopping or at least minimizing it. Built-in Contamination – Built-in contamination is found in new system components and is typically left over from the manufacturing process. 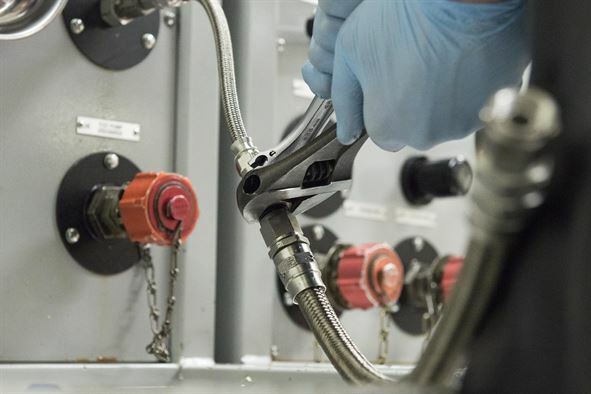 Examples of built-in contamination can include sand particles left over from metal casting, slivers of metal that remain after boring holes in a valve block, or a thread from a rag used to wipe down a hydraulic hose connection. It cannot be excluded, but it can be minimized by flushing new components with fresh hydraulic fluid. Leaks – When a system is leaking hydraulic fluid, not only can fluid leak out, but contaminants can also make their way in. This is an excellent example of why leaks should be addressed as soon as they are detected. 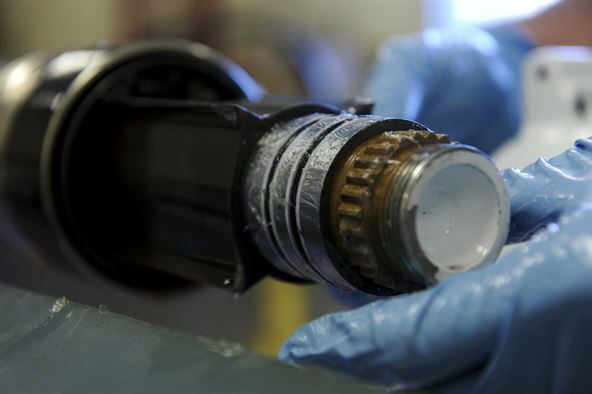 Many of these leaks are the result of failed seals that have reached the end of their service life and need to be replaced. Component Failure – If a component such as a pump or motor suffers a catastrophic failure, then very damaging contaminants can spread through the system if not contained by filters. 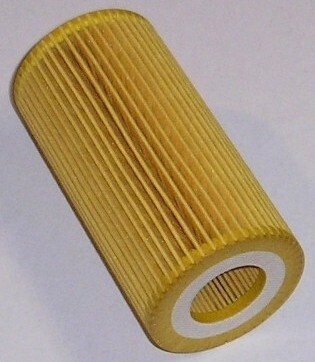 This is why it is so important to change filters when they have lost their usefulness. It is not uncommon for a system to require thorough flushing after a particularly bad failure (e.g., a bearing failure that releases chips and slivers of steel). Fresh Hydraulic Fluid – Another source of contamination is fresh hydraulic fluid, which can be contaminated both with particles and moisture. The levels of cleanliness in new hydraulic fluid often do not meet the cleanliness requirements for new equipment. This type of contamination can be excluded by filtering all fresh fluid before it is added to the system. As previously mentioned, contamination is also introduced during maintenance and repair (e.g., anytime the system is opened up). That type of contamination can be excluded by practicing cleanliness. One of the primary ways that contamination makes its way into a system is during repairs and maintenance. A port is opened during a repair, and dust from the workshop atmosphere makes its way inside. Maybe the work surface where the repair is taking place has some abrasive particles left on it from a previous repair. Perhaps the end of a hydraulic hose was dropped on the dirty workshop floor and wasn’t completely wiped clean before it was reattached. For equipment in the field, problems are even worse. Dirt and sand could fall into the hydraulic tank when new fluid is being added if the machine has not been cleaned first. Maybe a port is left open unnecessarily and moisture condenses inside. Dirty rags, dusty tools, gritty workbenches, rusty fluid storage containers – all of these can contribute to system contamination. 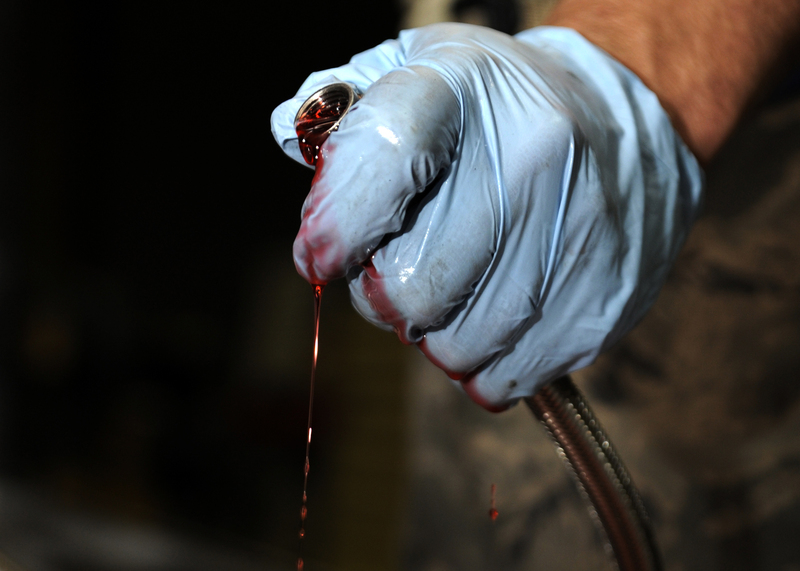 The starting point for preventing and reducing hydraulic fluid contamination is cleanliness. Tools, equipment, and work surfaces must be kept clean, and care must be taken when opening up the system for maintenance and repairs to make sure contamination does not have an opportunity to make its way inside the system. Contamination exclusion should be the highest priority and involves filtering all hydraulic fluid that enters the system and using quality filters to trap particles that do make their way inside. 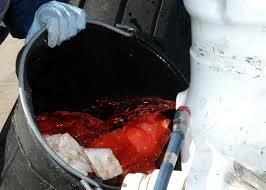 Fresh hydraulic fluid does contain contaminants. In fact, it is not at all uncommon for new hydraulic fluid to contain particles as large as 5 microns — which exceeds standard cleanliness requirements for modern hydraulic systems. This is why so much emphasis is placed on thoroughly filtering fluids before they are added to the system. It is critical to schedule regular testing to determine how well targets are being met, and this is accomplished through a rigorous program of fluid analysis and measurement. Fluid analysis involves sampling hydraulic fluid at various points in the system and either performing analysis in-house or sending it out to a laboratory. The results of analysis provide a measurement of contamination levels and can not only provide a metric to evaluate the cleanliness of the system but also assist in tracking down the sources of contamination. Once those sources have been identified, exclusion measures can be enacted to further reduce the ingress of contamination. The best defense against the loss of efficiency and damage caused by contaminated fluid in a hydraulic system is to enact a robust and thorough strategy for reducing hydraulic fluid contamination. Contamination exclusion, cleanliness, filtering, proper storage, and regular analysis are key components of an effective contamination reduction strategy. 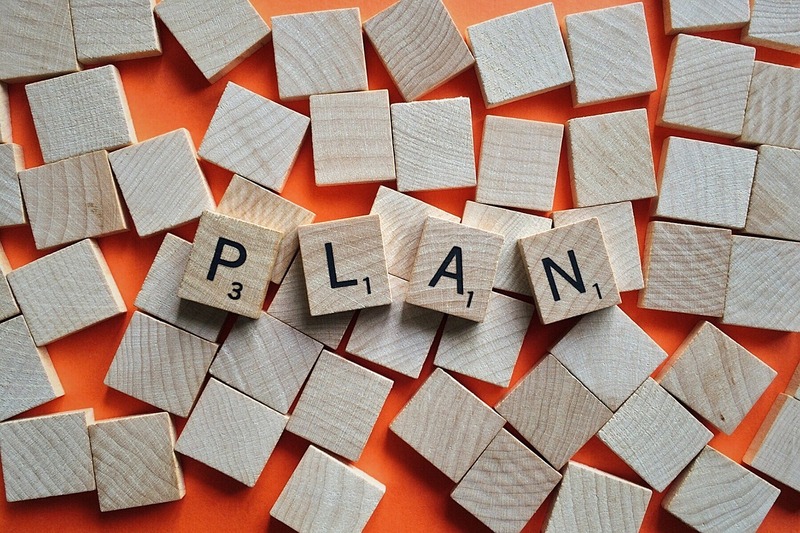 Once a good strategy is enacted, the benefits include better efficiency, higher productivity, longer component life, lower repair and maintenance costs, reduced downtime, and significantly better reliability. In short, implementation of a contamination control plan may be the best decision you make for your hydraulic systems and your bottom line. Contamination does not have to be a problem for your hydraulic equipment. MAC Hydraulics specialists will work with you to develop an effective, quantifiable contamination reduction strategy that supports the needs of your systems and the goals you have for them. Once that plan has been developed, our technicians will implement it. 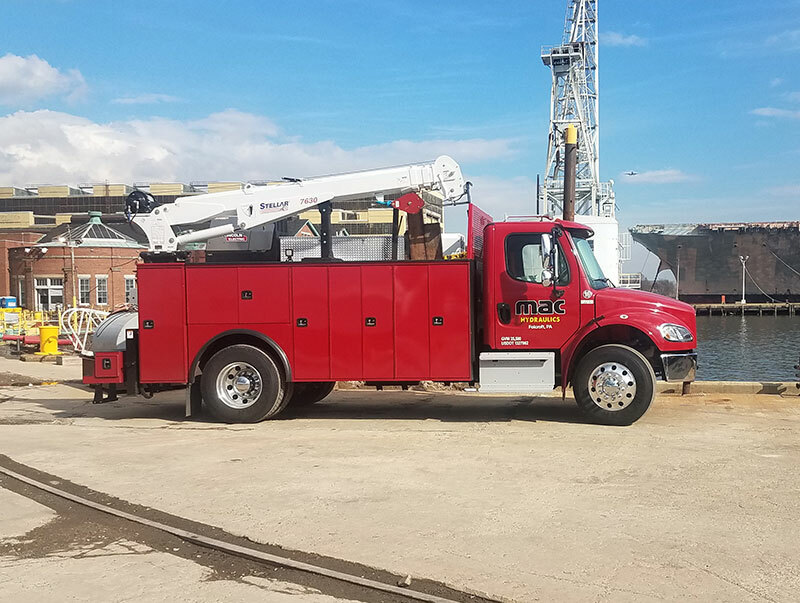 We have fully equipped service vehicles that will come to your facility and perform maintenance, repairs, testing, fluid analysis, and troubleshooting on your hydraulic equipment. Contact us today to find out more about the services that we offer that can help you minimize contamination and maximize productivity.